GORDONVILE — Should he stay or should he go? That was the bottom-line question facing Eagles Nation in the wake of being made into turkeys in front of a national audience on Turkey Day. 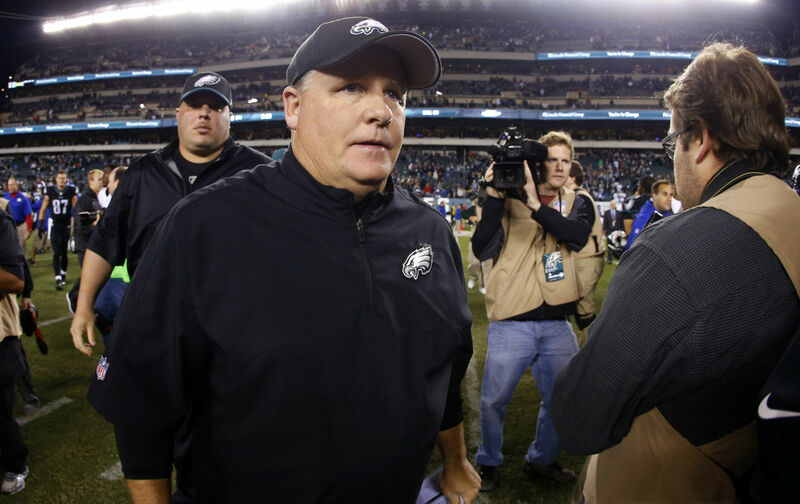 What do to with coach/general manager Chip Kelly, who has seemingly run out of all the mojo he showed while taking the league by storm in 2013? As of Thursday morning, this die-hard was firm that Kelly should man up and coach out at least four years of his five-year deal, if only out of principle. By the time the sun set and I was stuffed with stuffing, I wasn’t so sure. One game should never determine the fate of a coach, but this is more about the big picture than one game. I’m feeling a bit like a detective looking at all his evidence, finally having an epiphany and reaching a startling conclusion. I know what I would do. Hold a press conference Monday morning and fire Kelly and defensive coordinator Billy Davis. Offensive coordinator Pat Shurmur can finish up as interim head coach and defensive line coach Jerry Azzinaro can run the defense. If they fail, they fail. So what? Probably better anyway, as it will help draft positioning as yet another rebuild commences. But I’m not Jeffrey Lurie (as confirmed by my bank statement). He will probably wait and assess the damage after a season that very well could end up with, at best, one more win. With the sad reality that you can’t “fire the whole team,” the team needs to be sent a clear message. You can’t wear Eagles green and lay down on successive weeks. There are three home games remaining in December, and it is going to get as ugly as it can get – if anyone even shows up – unless something isn’t done as a preemptive strike. It’s clear the league has figured out Kelly’s offense and Davis’ defense, and something has to be done about it. Kelly’s Eagles find themselves 4-7 and hopelessly devoted to living in the NFL sewer system just three weeks after the optimists within felt the overtime win in Dallas coming out of the bye week could spark a winning streak that would put them at 7-4 – and in control on the NFC Least, a division where 8-8 might just be enough to back into capturing the flag. They came out of the Dallas game and shot out to a 16-3 lead against the visiting Miami Dolphins, only to fall, 20-19. Still, with Tampa Bay Buccaneers coming to town and a trip to the Motor City against a Lions’ team that started the year 1-7 (they are now 4-7) on tap, the schedule seemed to smile on the Eagles. Instead, the Eagles spat upon the schedule’s smiling face, laying twin eggs. In the 45-17 drubbing at the hands of the Bucs, rookie Jameis Winston threw five touchdown passes. That feat was matched by Matthew Stafford in the Thanksgiving Day massacre. No need to run for the calculators. In two must-win games, against two “eh” opponents, the Eagles were out-scored, 90-27, and yielded 10 touchdown passes to quarterbacks not named Marino and Montana. And, in both games, we saw something that can’t be quantified. The Eagles flat-out quit. It was clear in their body language, in the way they sat on the bench with stupefied looks on their faces, in the way they grinned after screwing up and the way they laughed it up with their tormentors between snaps. The Eagles were 10-6 in 2013, and won the division, a year after going 4-12. For his encore in 2014, Kelly’s version of the Birds started off 9-3 but finished 10-6 and out of the money for the postseason. Again, keep those calculators turned off. After a 19-9 start, Kelly’s Eagles are 5-10. Looking back on better times, quarterback Nick Foles had a career year in 2013. His play was a bit off in 2014, but was still 7-2 as a starter before going down with a season-ending injury. LeSean McCoy led the league in rushing in 2013 with 1,607 yards. He was not a good in 2014, with a dinged-up offensive line a big part of it, but still ran for 1,319 yards and became the franchise’s all-time leading rusher. DeSean Jackson, the mercurial wide receiver who previous coach Andy Reid didn’t seem to utilize to his fullest potential, had a career year in 2013 (82 catches, 1,332 yards, 9 TDs). He was then cut, outright, with no compensation. The Eagles also seemed to let it float out there that Jackson had gang affiliations. He signed with the rival Washington Redskins and, at the time this is being written, still isn’t charged with any crime. Fellow receiver Jeremy Maclin, who missed 2013 with a knee injury, played on a one-year deal in 2014 and had a career season (85 catches, 1,318 yards, 10 touchdowns). He was jettisoned in the offseason, leaving the Eagles with no real weapons at receiver (second-year man Jordan Matthews seems best suited as a No. 2 and some of the others on the team are barely worth discussing). It’s worth noting that Kelly’s title went from coach to coach/GM this past offseason, just two years out of the college ranks. He traded Foles to St. Louis for Sam Bradford. Despite assuming the injury risk and taking on the significantly larger contract, the Eagles also gave up the worst of the draft-pick exchange (including a second-round in the upcoming draft). Foles has since been benched in St. Louis, but he would have been in his third year in the system here and made a fraction per year of Bradford’s $13 million salary. That money could have been used for other pressing needs. Stats and quarterback ratings are nice (Foles led the league in QB rating in 2013), but it is all about winning and losing. Foles was 14-4 as a starter under Kelly. All others – Michael Vick, Mark Sanchez and Sam Bradford – are a combined 10-15. It should also be noted that once Sanchez started in Foles’ stead at the end of last season, Maclin was less of a factor because the deep ball was not a serious threat. In a stunning development, Bradford has gotten hurt. Ditto for Kiko Alonso, the linebacker coming off injury – and apparently playing at about 50 percent – who was acquired, straight-up, for McCoy. Kelly let guards Evan Mathis and Todd Herremans walk without adequate replacements. Even though former GM Howie Roseman was sent out for coffee and has never returned, it is not fair to blame him for drafting blunders (like last year’s whiff with Marcus Smith). Looking at the number of Oregon players drafted, and PAC-12 players drafted if no former Ducks are on the board, it is pretty obvious that Kelly’s fingerprints and DNA were all over the first two drafts. Bringing us to the question of the day: Should he (Kelly) stay or should he go? Lurie – prior to dissing Roseman – is not known for being prone to rash decisions (he kept Reid around two seasons too long), and it’s his call. Yes, he can sit down with Kelly and have a heart-to-heart discussion. If Kelly is willing to change, maybe his tenure here can be salvaged. The question would be if he is too prideful, and stubborn, to realize that one-trick ponies don’t survive in this league. The hurry-up offense is fine, but it loses effectiveness when deployed from wire to wire. He has two good backs – DeMarco Murray and Ryan Mathews – in McCoy’s stead, but they both need to run behind a fullback (none even on the roster) and with the quarterback under center. And Davis would have to go. Period. End of story. As for the GM thing, there is speculation that removing the title could null-and-void Kelly’s deal. How about a venerable person in the personnel mix – a consultant – who has to sign off on all moves going forward? Kelly can keep the title but needs someone other than Ed Marynowitz picking up his dry cleaning. If the Eagles come out of their self-induced coma a bit, and he agrees to these changes, maybe he salvages a second chance and fourth season to get it right. But once Philadelphia turns hostile, it is nearly impossible to win back trust. That’s what we are looking at. Ask me, he should go – and go now. For the next coach – and we are getting ahead of ourselves – there is no need to reinvent the wheel. I start with Bill Cowher and Jon Gruden and go from there, maybe with successful coordinators. Hard to believe we are talking about this? Yeah, me too. But when a marriage goes bad, just file those divorce papers. No need to stay together for the sake of the kids, especially when they are an angry mob hungry for a long-elusive Super Bowl. This entry was posted in Sports on November 28, 2015 by gordonglantz.